Tickets can be purchased at 313Presents.com, the Fox Theatre Box Office and the Little Caesars Arena XFINITY Box Office (both without service charge) and Ticketmaster.com. To purchase tickets by phone, call 800-745-3000. 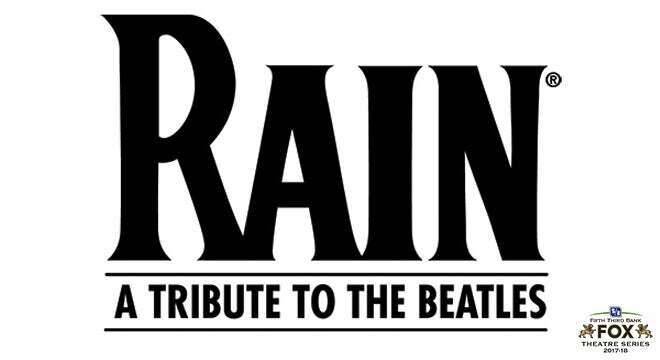 Join RAIN: A Tribute to the Beatles as they celebrate the 50th anniversary of the release of the Sgt. Pepper’s Lonely Hearts Club Band album. The celebration begins at Fox Theatre on Sunday, April 29 at 7 p.m.
As “the next best thing to seeing The Beatles!” (Associated Press), RAIN performs the full range of The Beatles' discography live onstage, including the most complex and challenging songs that The Beatles themselves recorded in the studio but never performed for an audience. In addition to the updated sets that include brand new LED, High-Definition screens and multimedia content, RAIN will bring the Sgt. Pepper’s Lonely Hearts Club Band album to life in its entirety with the launch of the 2018 Tour. Together longer than The Beatles, RAIN has mastered every song, gesture and nuance of the legendary foursome, delivering a totally live, note-for-note performance that’s as infectious as it is transporting. Let RAIN take you back with all of the songs from Sgt. Pepper’s Lonely Hearts Club Band along with all of your other Beatles favorites such as “I Want to Hold Your Hand,” “Hard Day’s Night,” “Let It Be,” “Come Together,” “Hey Jude” and more. This adoring tribute will take you back to a time when all you needed was love, and a little help from your friends. Like The Beatles, the onstage members of RAIN are not only supreme musicians, but electrifying performers in their own right.